According to Verified Market Research, The Global Narrowband IoT Market was valued at USD 175.5 Million in 2018 and is projected to reach USD 1.7 Billion by 2026, growing at a CAGR of 34.8% from 2019 to 2026. Europe is considered one of the significant regions in terms of the Narrowband IoT market as it comprises some of the key industry players in the market. As these key players have participated in the early adoption of Narrowband IoT technology, Europe stands at the forefront of the market. The Asia Pacific region is expected to grow quickly in terms of the global Narrowband IoT market as there is an increasing number of investments that are occurring regarding the development of smart cities. The Narrowband Internet of Things, otherwise known as Narrowband IoT is a low power wide area (LPWA) technology which was developed to enable a wide range of new IoT devices and services. Low power wide area (LPWA) technologies, in general, fill the gap between mobiles such as 3G, LTE and short-range wireless such as Bluetooth, WiFi, and ZigBee networks. 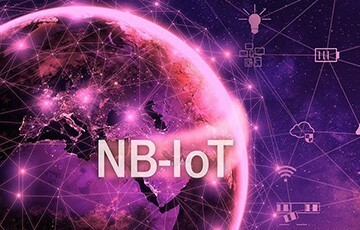 NB-IoT is designed for machine communications; its essential function is to provide connectivity for devices and applications that require low levels of data transfer and low mobility. It securely and reliably handles small amounts of fairly infrequent two-way data. Narrowband IoT considerably reduces user device power consumption compared to standard LTE, it enhances system capacity, and spectrum efficiency. The technology is well adapted for IoT applications and devices such as wearables, utilities, industrial solutions as well as smart parking. Narrowband IoT has been designed to offer a hight level of reliability and it allows the connection of a large number of devices simultaneously while maintaining power consumption. Narrowband IoT is supported by all major mobile equipment, chipset and module manufacturers. It can co-exist with 2G, 3G, and 4G mobile networks and also profits from the security and privacy features of mobile networks, such as support for user identity confidentiality, entity authentication, confidentiality, data integrity, and mobile equipment identification. The implementation of Narrowband IoT offers various benefits such as better power efficiency, cost savings, reliability and wider deployment for IoT devices. Since technologies such as NB-IoT have a simpler waveform, they tend to consume less power. NB-IoT chips are also simpler to create and thus come cheaper. Narrowband IoT implementation also leads to improved reliability for users as well as the guaranteed resource allocation needed for managed Quality of Service. 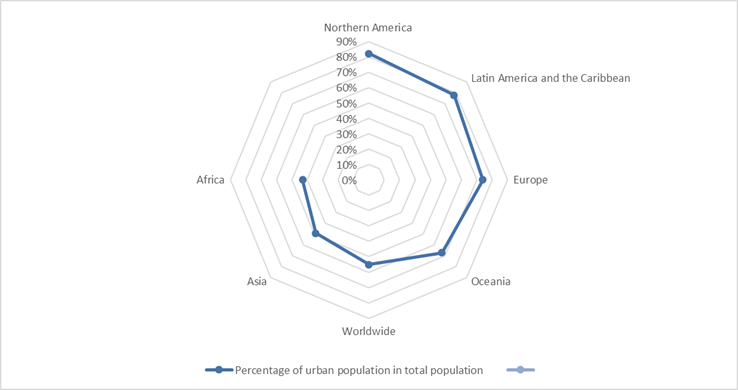 It can be seen that the degree of urbanization for every region is above 49% as of 2018, indicating the extent of urbanization that is occurring in regions worldwide. This increase in urbanization is pushing regions further toward technology and development in daily life- one example of this are smart cities. Narrowband IoT is expected to be largely employed in smart cities applications. Some examples of these include waste management, parking solutions, streetlight monitoring and smart metering. Despite the competition of other Low Power Wide Area (LPWA) networking technologies, Narrowband IoT should quickly be overtaking them. Factors such as the reduced cost of the chips and superior performance should facilitate the Narrowband IoT take over on “older” LPWA networking technologies in the near future. It is estimated that by 2025, there will be over a billion LPWA connections, out of which Narrowband IoT will make up over half. This can be said as the number of Narrowband IoT applications is emerging rapidly. The applications include solutions for healthcare, retail, logistics, smart buildings, and wearable devices. The technology is expected to increasingly compete with short-range wireless technologies such as Zigbee and Bluetooth. There are several factors that are benefitting the growth of the Narrowband IoT market. These factors include the accessibility to increased network coverage (ability to obtain service in areas where signals are not conventionally available), the growing emergence of smart cities and smart buildings. A factor that is expected to restrain the growth of the overall Narrowband IoT market involves the lack of awareness of the system. This may lower the potential for the implementation of the technology at least on the short term. Another factor that is the uncertainty in the pricing model of the Narrowband IoT technology from the operators. Some of the major players involved in the Global Narrowband IoT Market are El Huawei Technologies co. ltd., Qualcomm Technologies, Inc, Ericsson Corporation, Vodafone Group Plc, Nokia Corporation, SEQUANS Communications SA, Quectel Wireless Solutions Co., Ltd, ZTE Corporation, Sierra Wireless, and Intel Corporation. El Huawei Technologies co. ltd. New Product/Service Launch · Huawei launches the world’s first 3GPP R14-based commercial NB-IoT solution.